I don't know how it's already the end of August, but somehow it's time to wrap up this month's remix series! This is probably my favorite look of the three because I love the hip, casual vibe of my Budweiser tee and booties with a skirt. I'm basically dying for a concert to wear this to...haha. And now for a recap of all 3 looks! Which remix look was your favorite?? Jacy, la falda es divina y te sienta de maravilla!!! Love the Budweiser tee one the most. love that budweiser top! super cute outfit girl! LOVE THIS! And it is hard to pick a favorite, but I have been all about graphic t-shirts lately, so for me I think this one takes the cake :) Love those booties too! Loveeeee those booties and Budweiser top! So cute.. Such a pretty little skirt, definitely worth wearing over and over again! All three looks are fabulous! 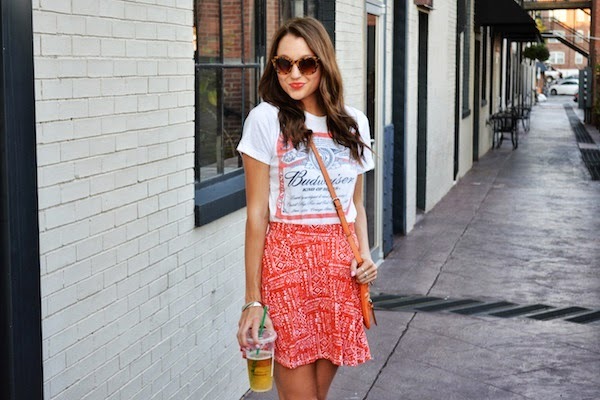 This is such a fun tshirt and great casual way of styling the skirt. Always love seeing your recaps, thanks for including them. My fav this time has to be the beautiful first look! Happy Friday Doll! This is such a cute skirt! I haven't seen it at my Target. My favorite look is the one with the Budweiser t-shirt. It's super on trend and I love that it was from the men's section. They always have cool tee's. uau!! love your blog and your syle!! I am obsessed with the fact that you teamed this look with a printed t shirt, so fun! So stylish and perfect for summer! love the different looks with the skirt. great post! Great styling J, love the last one with that Budweiser tee and booties. Something I'd totally wear in a heartbeat!